Following on from part one of this update preview, I thought I’d best show you the rest of what’s going to be appearing. Firstly there’s a little Bedale 4ply – that’s the 4ply baby yak/silk blend. It’s soft and cosy but drapey too. It’s designed to be a good alternative to cashmere/silk blends, and I think it lives up to that really well. There’s just one dyelot of Rambling Rose and one dyelot of Compost (I personally think the Compost is darker in real life). The rest of the update though is BFL Sock. Here’s one of each, along with Milburn 4ply in Natural and Steel because they work really well with BFL Sock. The colours are (top row first, L-R): Briar Rose, Thunder, Bark, Wild Raspberry, Robin Egg, Tarn, Rosehip, Clematis, Fuchsia, Clematis Montana, Coppice, and Oak. I’ll follow with some colour combinations for you. Firstly I put the Milburn 4ply in Steel and Natural with the BFL Sock in Bark and Oak (top left) for a neutral palette. Then I just swapped in various shades to see how that affected the overall look. So in the top right you have Rosehip and Robin Egg, Then in the large centre picture you have Wild Raspberry, and then clockwise from the bottom right there’s Fuchsia, Tarn, Thunder, Briar Rose, and Coppice. I don’t even know which one of these is my favourite.. how about you? Next I put bark (on the left in the two left hand photos) with Robin Egg. I love these two together and am thinking of making a Missed Kingfisher (we stock the book – that’s my excuse) in them. Then I added Natural – I think those three together are just lovely. Light and delicate but not too flowery. However if you swap out the Bark for Briar Rose it completely changes the look, and that is a bit more flowery – it depends what your taste is for! Ok moving onto Rosehip, which is in all of the pics below. I’ve got it with Natural and Fuchsia (top left), just Steel (top right), Steel and Fuchsia (next one down) and Thunder and Fuchsia (main pic). I particularly love Rosehip with Steel – I think the proper grey makes the coral really gorgeous, but I do rather like it with Natural too. Next up is mostly a pink theme – top left we have Natural, Clematis Montana (variegated – I’ll show you some better pics of that) and Clematis (the semi-solid colourway that I’ve been doing for years!). Top right is Wild Raspberry, Coppice and Oak. Bottom left is Natural, Wild Raspberry and Clematis. In case you’re wondering, I don’t think there’s enough contrast between those two pinks for you to stripe them next to each other. Then bottom right we have Steel, Wild Raspberry and Coppice. 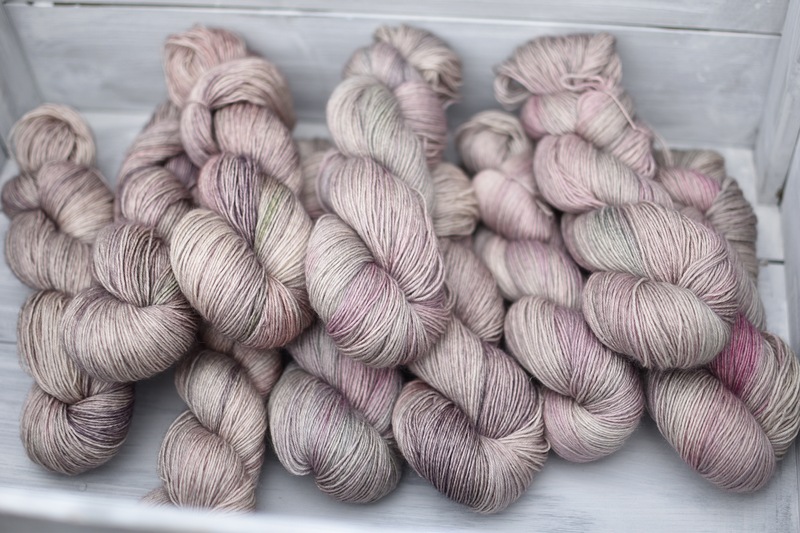 Finally for the BFL Sock, we have Briar Rose, Thunder and Bark on the top right there, and then the same but with added Natural on the left – I love those four together, I think they’re very dusky and lovely. And then on the bottom right we’ve got Bark and Robin Egg, which we had earlier, but with Tarn added too – I think that makes a lovely moody blue (hah, sorry, couldn’t resist) palette. I’d better just show you the Clematis Montana batch – there are ten skeins and they are all different because they are a combination of handpainted and kettle dyed, so the colours are quite random. If you buy more than one I’ll do my best to match them but you will need to alternate skeins (I’d recommend that with any hand dyed yarn but it’s extra-important with variegated batches). There are just a couple more things to tell you: firstly I’ve just had project bags delivered, so lots of the kits are back in stock, plus the project bags themselves. 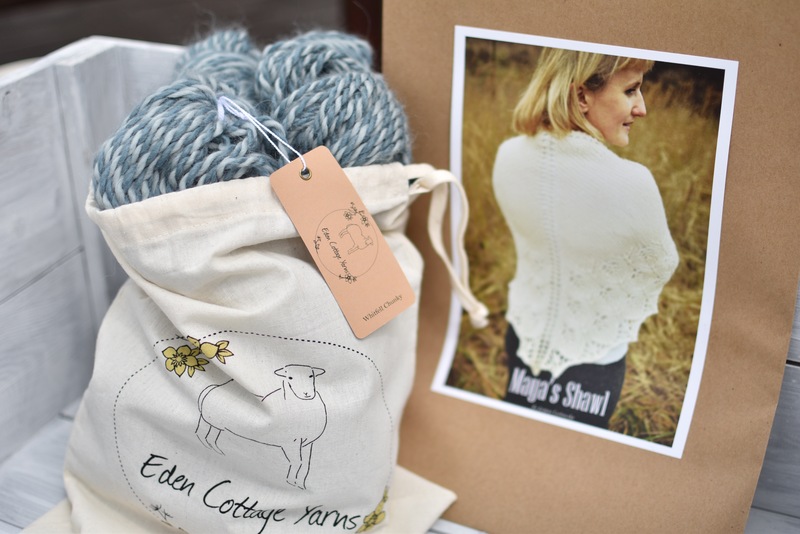 I’ve added the Maya’s Shawl kit to the store – mostly for our friends in Australia who seem to be needing chunky baby alpaca right now. Don’t forget international shipping is free on orders over £100 and you’ll get the UK VAT taken off (that’s 20% so it’s not insignificant). And finally just a reminder that a wide selection of ECY patterns are now half price to clear – because when I restock I want to get them in A5 format instead of A4, but I do need to clear the A4 stock first. They all come with pdf download codes too.